Listening to audiobooks has gradually become indispensable in our daily life. As it is rare to have lots of spare time, we have to pick up small fragments of time to read, to learn, to understand something. Of course, in this point, audiobooks is a good choice. However, many problems come when we enjoy them. .AA audiobooks form Audible.com, M4B audiobooks form iTunes Store, or M4A audiobooks are always DRM protected which imposes many restrictions on us purchasers, like we cannot play them freely on our Sony Walkman, Zune, Mobile Phone and the like. Well, it is a good idea to convert .AA, M4B, and M4A audiobooks to MP3, as MP3 is a much more compatible audio format to lots of portable audio players. Macsome Audio Book Converter can do us a favor. This software is designed exclusively for people to bypass DRM of .AA, M4B, and M4A audiobooks and convert them to MP3 format. Practical and user-friendly, this software makes us to convert .AA, M4B or M4A audiobooks easily and quickly. AA is an audiobook format we are not familiar more. The high quality .AA audiobooks offer us more than a feast for the ear. However, the DRM .AA audiobooks has more or less brought us some troubles. Apart from the limitation of playing them on designate audio players, we also cannot share our favorite .AA audiobooks with our friends freely. Just apply this software to convert .AA to MP3. It will bypass DRM of .AA audiobooks by recording them in the background silently, while at the same time saving the recorded audiobooks in MP3 format. The method is legal and tactful. And the operation is easy and quick. Just with a few mouse clicks, we can get favorable MP3 audiobooks. What's more, the converted MP3 audiobooks features high output quality which has proven by the practices. So just rest assured to use the software. M4B audiobooks is DRM protected which are purchased from iTunes Store. Similar to .AA, M4B audiobooks cannot be enjoyed on Zune, Blackberry, Sony Walkman, Mobile Phone and the like popular portable audio players. So converting them to MP3 is inevitable, if we wish to enjoy them at will. 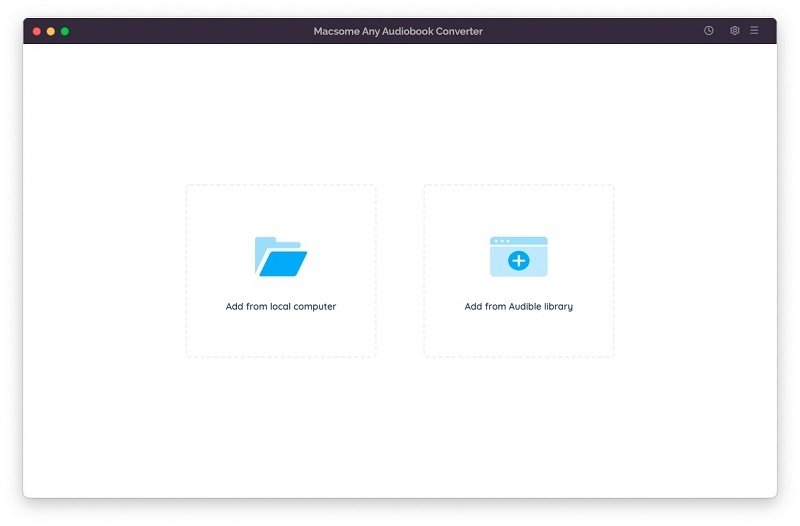 Macsome Audio Book Converter can well help out. We just follow the simple instruction from its intuitive interface, and just wait a minute, we can get the MP3 audiobooks without DRM protection. It is easy and quick to convert M4A audiobooks to MP3 format with this software. The procedure is the same as converting .AA, M4B audiobooks to MP3. One thing to keep in mind is that this software only supports importing audiobooks form iTunes Audiobook library. So before add M4A audiobooks to the software's file list, we should import them to iTunes Audiobook. To Macsome Audio Book Converter, converting AA, M4B, M4A audiobooks to MP3 is quite easy and quick. Just with several mouse clicks can we get the more compatible MP3 audiobooks, which we can play freely and share with friends at will. Why not have a try?